Beijing Mebo TCM training Center (Mebo) was set up in 1999 based on the effective support of the Wangjing Hospital, China Academy of Chinese medicine Sciences (CACMS) . It was the first one to offer the online TCM training courses in China. Till now more than thousand students from over 80 countries and areas of the world have taken part in and graduated from Mebo for online courses or clinical internship. With its long history, systematic theories and excellent clinical efficacy the traditional Chinese medicine (TCM) is attracted more and more attention from the people all over the world in recent years. However, it is difficult for more foreigners to come in China to learn the Chinese medicine due to a long distance and expensive cost. Fortunately, the Internet makes it easy for the people far from the China to learn the Chinese medicine as well as Chinese culture and arts at home. In 1999, the website of Mebo was founded to offer the online TCM training program. Since then, Mebo aims at spreading the TCM culture and technologies, promoting the development of Chinese medicine oversea and offering the healthy information and service for the people abroad in the world through Internet. CACMS, founded in 1955, is the largest research organization on TCM throughout the country, which has all the necessary disciplines of TCM, advanced equipment and solid scientific research strength. In the Academy, there are 13 institutes, 6 hospitals. The staff of CACMS, in total, is over 4,000, including 3,200 professionals in various fields of Chinese medicine and western medicine. Among them, more than 900 are holding different senior professional titles. In addition, 3 WHO collaborating centers for traditional medicine have been set up in the fields of clinical medicine and information, acupuncture and Chinese materia medica. Wangjing Hospital, established in 1997, is one of the 47 top-grade hospitals in Beijing. The hospital proper covers 37441.33 sq meters and the out-patient building has been built with more than 2000 outpatients every day. It includes 550 beds, 35 clinical departments, 14 research departments and 14 educational research departments. It has 871 staff members, including 540 medical staffs consisting of 120 professors, 207 middle-level and 182 primary-level technicians, 10 tutors of doctors and 33 tutors of masters. Mebo TCM Online Training Program, making full use of the Internet features of convenience, swiftness, and intercommunication, is adopting the teaching model of online study, distance tutor and examination as well as off-line clinical practice. Personalized teaching schedule is made according to the students' individual background of knowledge, the speed of study and the time used. At the same time, audio teaching system is combined to assist the students' study. Therefore, on one hand the teaching quality could be guaranteed and on the other hand great deal of time and cost for the overseas students could be saved. In Mebo, most of the teachers are from CACMS and Wangjing Hospital, some from Beijing University of TCM. Holding senior professional titles on TCM the teachers have not only profound theoretical knowledge on TCM, but also rich clinical experiences. The translators in Mebo are also from the CACMS with professional translating experience on TCM and acupuncture. In addition, some teachers have oversea working or teaching experience, they can directly teach the students in English fluently. Mebo TCM online Training Program runs seven online courses of traditional Chinese medicine, such as Basic Theory of TCM, Diagnosis of TCM, Therapeutics of Acupuncture & Moxibustion, Herbology, Formulae of TCM as well as Therapeutics of Chinese Herbal Medicines. In the program, all of the course textbooks are put in the website. The student can login the online courses by username and password to study the courses or download them to his/her computer and then study the courses one by one at home. For each course there are the studying schedule, reading materials and examination paper to help and supervise the student to study the courses. A personal tutor, who can write and speak in English, will be arranged to guide your study and answer your question during your study. In addition, the student can ask any question and make discussion with tutor and classmate in the Mebo Online-training Students Forum (specially offered to Mebo students). The Mebo tutor will answer the questions within 24 hrs. The graduated student will obtain the certificate and transcript after finishing all of the online courses and passing the required exams. The training program is dividing into two types based on the different conditions of the participants. Regular Clinical Internship: This program is mainly suitable for the persons who have finished the Mebo online courses or graduated from the TCM and Acupuncture School in home country, and other persons who are interesting in Chinese traditional culture and arts and study some TCM by their-self, capable of grasping systematically the theories and wish to make clinical practice. The mode of internship is to take the clinical practice in the morning and classroom lecture in the afternoon. The internship will be held in Wangjing Hospital. Advanced and Special courses: These courses are suitable for the Chinese medicine practitioners, acupuncturists and chiropractors, who want to improve their level and ability of clinical diagnosis and treatment. Included in the program are the introduction to the latest research advance of traditional Chinese medicine and pharmacology, the clinical experience of some famous veteran TCM doctors, the diagnosis and treatment of some complicated and intractable diseases, and some unique and effective diagnostic and therapeutic methods. The format of training is to take the lectures and watch the performance, and also practice on each other under the guide of teacher in the classroom. The veteran experts in the clinical practice from CACMS will be invited to make the lecture. The participant will obtain the certificate issued by Wangjing Hospital after finishing the internship and the advanced courses. The Mebo website provides abundant information of TCM culture and technologies, Chinese medicine news and reports, as well as healthy knowledge of acupuncture, qigong, massage and dietotherapy, etc. In addition, Mebo Forum offers a wealth of information and interaction for visitors and students. Prof. Ping Pan, graduated from China Academy of Chinese Medical Sciences with Master degree. The Directer of Mebo TCM Training Center. 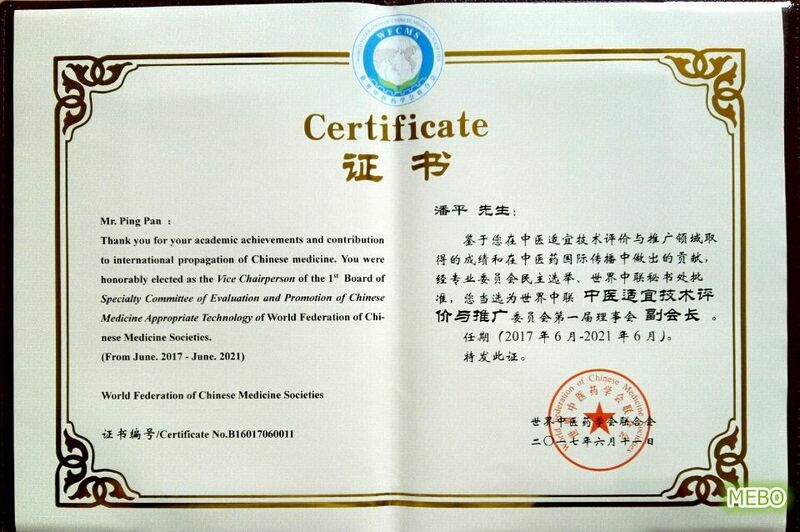 The Vice Chairperson of the Board of Specialty Committee of Evaluation and Promotion of Chinese Appropriate Technology of World Federation of Chinese Medicine Societies(WFCMS). WFCMS was established by the State Council of the People's Republic of China, registered by the Ministry of Civil Administration, its headquarters is located in the Beijing People's scientific organization. The current Chairman of the Federation - Ms. She Jing is a former Deputy Minister of Health of China, the former head of the State Administration of Traditional Chinese Medicine and Pharmacology. At present, the federation includes 251 societies from 67 countries and regions. The purpose of World Federation of Chinese Medicine Societies – to promote mutual understanding and cooperation of Chinese medicine medical societies of all countries (regions), the strengthening of international scientific exchange and raising the professional level of doctors of Chinese medicine, the protection and development of Chinese medicine and to promote the penetration of Chinese medicine in the basic medical direction of all countries; promote the development of Chinese medicine cooperation with different world healthcare systems to make an even greater contribution to the maintenance of humanity health.